Want to toss out the windows in your current application session, preventing them from reopening again via the Resume feature in OS X? 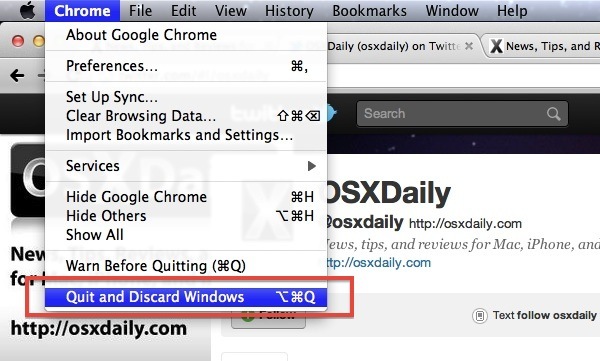 Hold down the Option key while going to Quit and you will see the option to “Quit and Discard Windows”. When you quit with that option, you can relaunch the app and Resume will not relaunch any past windows. This is a great choice if you are browsing the web with a lot of tabs that you don’t want open again, and for a variety of other apps where the previously opened windows wouldn’t do you any good to automatically reopen. Discarding windows this way is not a permanent change to Lion or the app, although you can disable window Resume completely if you don’t like the feature. Additionally, you can delete individual apps saved states after the fact. Hi. This is a great TIP, I began hating MAC OS X Lion because this ‘resume feature’. My Mac does the same thing. This is because we disabled resume from the System Preferences menu (see link below). So, while everyone else’s windows restore by default, our programs always discard. this is a genius tip! indeed a great tip! I have the global option in sys.prefs. checked off, but preview, textedit, quicktime, pages, numbers – just about everything still opens all previous windows unless I follow this tip. Or maybe I’m confusing the concept of resume with the concept of reopening windows. Anyway, great tip! thanks! You can also get around this by changing the keyboard shortcuts on the apps where you want a different behaviour from the system setting. I have the Resume feature turned off at the system-level, but in one app, OmniOutliner Pro, I like to re-open the windows I last had open (similar to what previous versions did before they updated the app to fit in with the Resume feature). Therefore, I can just keep using Command+Q consistently across my apps and have tweaked the behaviour for just this one to keep the windows on exit. A bit easier than mucking around with permissions on state files, etc. I’ve tested on Safari as well, but when I went back to having the Resume feature off, I didn’t need it anymore. Depends on how you have your preferences set. If you’ve got the resume window box unchecked then command quit will ONLY give you the quit and open windows option.